Tourists in Greece will be unable to buy food or medicine within days if a deal is not reached to reopen the banks, the head of a leading business body has warned. Constantine Michalos, president of Athens Chamber of Commerce, has warned that there could be “shortages on the shelves” by early next week and tourists could be left without “basics”. He warned that shops will begin to close on Friday and not reopen because they are unable to import products due to the bank closures. The Foreign Office increased warnings to British tourists heading to the country for their summer holidays this week as banks remains close and limits were placed on ATM withdrawal. Speaking to BBC Radio Four’s Today programme, Mr Michalos warned holidaymakers would be left without access to essential food and medicines unless the situation is resolved soon. “We will see as of next week shortages on the shelves”, Mr Michalos. “We are not in the position, although we may have funds in our accounts, to actually import goods and the major worry here is with basic sectors of the economy such as food and pharmaceuticals." GREECE'S cash reserves are rapidly dwindling, with the country estimated to have just €500m left. The daily cash allowance from ATMs has now been reduced to just €50, amid reports the country is running out of €20 notes. Many ATMs in the country have run out of cash entirely. Supporters of Greece's bailout terms have taken a wafer-thin lead over the "No" vote backed by the leftist government, 48 hours before a referendum that may determine the country's future in the euro zone, a poll showed. An earlier poll by the respected ALCO institute, published in the Ethnos newspaper on Friday, put the "Yes" camp on 44.8 percent against 43.4 percent for the No" vote. But the lead was within the pollster's 3.1 percentage point margin of error, with 11.8 percent saying they are still undecided. But the most recent poll puts those opposing Greece's bailout terms with a 0.5 percentage-point lead over the 'Yes' vote, a poll by Public Issue for the Syriza-published newspaper Avgi showed on Friday. The poll, carried out between June 30 and July 2, found 43 percent of Greeks would vote 'No' in Sunday's referendum on bailout terms while 42.5 percent would vote 'Yes' and 9 percent were undecided. With banks shuttered all week, cash withdrawals rationed and commerce seizing up, the vote could decide whether Greece gets another last-ditch financial rescue in exchange for more harsh austerity measures or plunges deeper into economic crisis. It could also determine whether Greece becomes the first country to crash out of the 19-nation European single currency area, membership of which is meant to be irrevocable. The survey found that 74 percent of Greeks want to stay in the euro, while just 15 percent want to return to a national currency, with 11 percent undecided. The IMF has warned that Greece needs a new €50bn bailout to stay afloat as voters go to the polls on Sunday to decide whether to accept the Troika's terms for help. The stark warning came days after Greece defaulted on part of its debt. The latest assessment by the IMF concluded that the EU countries would supply €36bn of the €50bn and that Greece would still require debt relief. 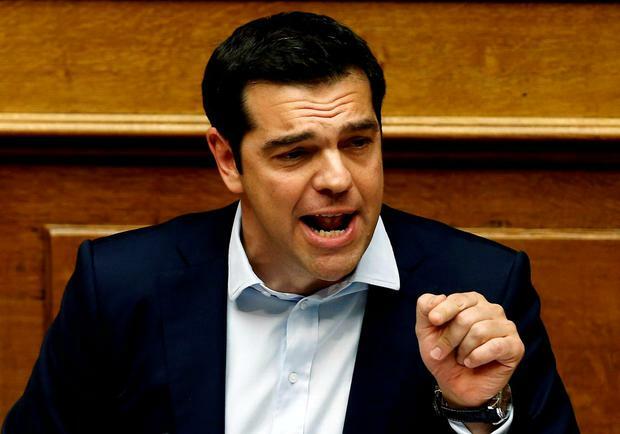 Prime Minister Alexis Tsipras' rejection of what he terms the "blackmail" of EU and IMF creditors demanding spending cuts and tax hikes has so angered Greece's partners that there is no hope of reconciliation before Sunday's vote. Mr Tsipras and his finance minister, Yanis Varoufakis, remain convinced Athens can negotiate better terms, including debt relief, if voters reject the conditions on offer. The euro zone's rescue fund, Greece's largest creditor, said on Friday it reserved the right to call in €130,9bin debt ahead of schedule after Athens defaulted this week on an International Monetary Fund loan. The board of the European Financial Stability Facility decided to reserve its rights to act at a later stage on the outstanding loans to Greece, an EFSF statement said. The decision was announced two days before Greeks vote in a referendum on whether to accept bailout terms rejected by their leftist government. European officials have said a "No" vote could lead to the country's exit from the euro zone. The EFSF's chief executive, Klaus Regling, made the recommendation rather than the two other options - waiving the debt or demanding immediate repayment, which would have forced euro zone governments to take large losses. Greece was being "blackmailed", Tsipras said, quashing talk that he might delay the vote, call it off or urge Greeks to vote "Yes". The remarks added to the frantic and at times surreal atmosphere of recent days in which acrimonious messages from the leftist government have alternated with late-night offers of concessions to restart negotiations. A day after Greece became the first developed economy to default on debt to the International Monetary Fund, long lines at cash machines provided a stark symbol of the pressure on Tsipras, who came to power in January vowing to end austerity and protect the poor. "A 'No' vote is a decisive step towards a better agreement that we aim to sign right after Sunday's result," he said, rejecting repeated warnings from European partners that the referendum would effectively be a vote on whether Greece stays in the euro or returns to the drachma. European Council President Donald Tusk retorted in a tweet: "Europe wants to help Greece. But cannot help anyone against their own will. Let's wait for the results of the Greek referendum." Euro zone finance ministers held an hour-long conference call to discuss the previous night's offer from Tsipras, but were adamant that no further discussions would be held until after Sunday's vote. "We will come back to your request for financial stability support from the ESM (European Stability Mechanism) only after, and on the basis of the outcome of, the referendum," the head of the currency zone ministers' Eurogroup, Jeroen Dijsselbloem, wrote in a letter to Tsipras. IMF Managing Director Christine Lagarde told Reuters in an interview that she would want to see reforms before opening discussions on any new debt package. Global financial markets have reacted remarkably calmly to the widely anticipated Greek default, strengthening the hand of hardline euro zone partners who say Athens cannot use the threat of contagion to weaker European sovereigns as a bargaining chip. "Financial markets are not showing there is contagion or spreading of those risks to the periphery," Bank of England Deputy Governor Jon Cunliffe told BBC Radio 5live in an interview. In his overnight letter to creditors, seen by Reuters, Tsipras agreed to accept most of their demands for taxes and pension cuts and asked for a new 29 billion euro loan to cover all debt service payments in the next two years. However, even if negotiations do restart after the referendum, Germany and others made clear that any talks on a new programme would have to start from scratch with different conditions. The exasperated tone to public comments of European leaders exhausted by the chaotic turnarounds of the past few days offered little hope of a breakthrough. Tsipras has suggested he would step aside if Greeks vote "Yes" in Sunday's referendum. "This government has done nothing since it came into office," German Finance Minister Wolfgang Schaeuble said in a speech in the lower house of parliament in which he accused Athens of repeatedly reneging on its commitments. "You can't in all honesty expect us to talk with them in a situation like this," he said. French Finance Minister Michel Sapin, among Greece's strongest sympathisers in the euro zone, told RTL radio, "The aim is to find an agreement before the referendum if possible ... But it's dreadfully complicated." Lagarde declined to be drawn out on whether she viewed Tsipras was a reliable negotiating partner after his latest switch, although she did say the Fund wanted to see evidence of reforms before talks about any new potential debt package. "We have received so many 'latest' offers, which themselves have been validated, invalidated, changed, amended, over the course of the last few days, that it's quite uncertain exactly where the latest proposal stands," she said. 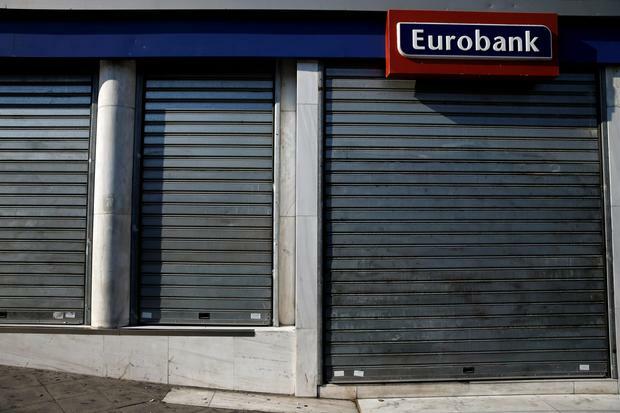 Greece has shut its banks this week, imposed capital controls and limited teller machine withdrawals to prevent the public from emptying the banks. 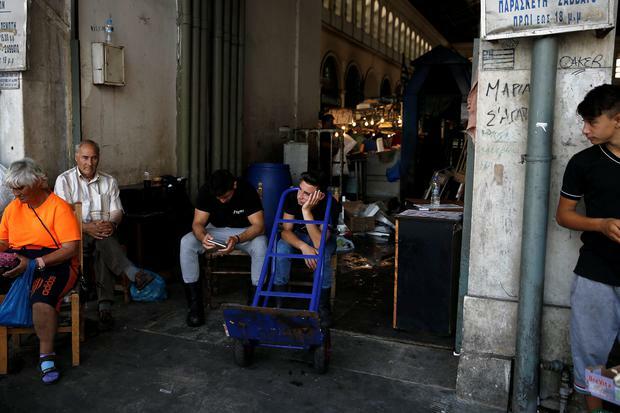 On the third day of the closure, the costs were biting deeper for ordinary Greeks, with long lines forming at many ATMs and limited amounts of cash being doled out to pensioners. Even with a withdrawal limit of 60 euros a day, there were signs of banknote shortages, with bankers saying 50-euro and 20-euro notes were running low. The European Central Bank said it would maintain emergency lending that is keeping Greek banks afloat at the same level as late last week, keeping pressure on Greece as its lenders run out of cash. Kiki Rizopoulou, a 79-year-old pensioner from Lamia in central Greece, had to travel to Athens to collect her pension, spending 20 euros of the 120 euros she was allowed to withdraw. "I already have to pay back 50 euros that I owe. It's embarrassing," she said. An opinion poll showed opposition to the bailout in the lead but also that the gap had narrowed significantly as the bank closure and capital controls began to bite. 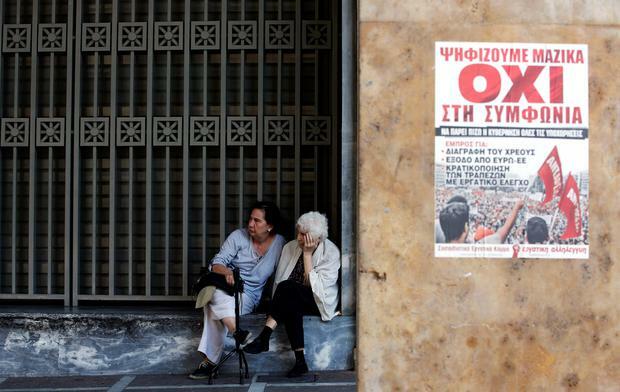 Posters from the ruling Syriza party calling for a "No" vote started to appear in central Athens. A large white banner declaring 'No to blackmail and austerity!' was unfurled from windows of the finance ministry. 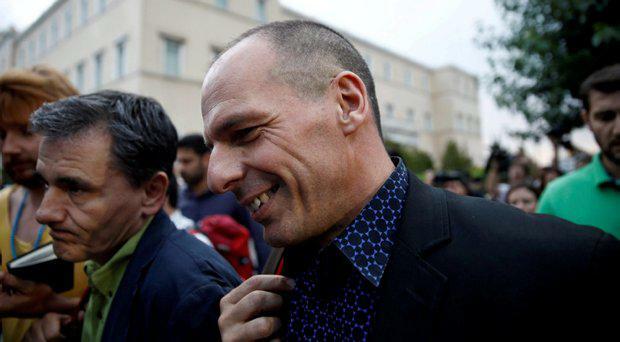 Finance Minister Yanis Varoufakis said on Twitter that it was the work of "unionists" and it was later removed. The Tsipras letter asking for a new bailout deal appeared to move closer to accepting creditor demands. But it contained only a single sketchy reference to labour market reform and no mention at all of frozen privatisations, both big priorities for the creditors. He asked to keep a discount on value-added tax for Greek islands, stretch out defence spending cuts and delay the phasing out of an income supplement to poorer pensioners. The lack of panic in financial markets stood in marked contrast to 2011, when the Greek crisis was perceived as a threat to the future of the single currency and investors bid up the borrowing costs for other countries seen as being in danger, like Spain and Italy. Most euro zone leaders now believe any damage to the currency zone from Greek turmoil can be contained. In a poll by the ProRata Institute published in the Efimerida ton Syntakton newspaper, 54 percent of Greeks planning to vote would oppose the bailout against 33 percent in favour. Of those polled before the announcement of the bank closures, 57 percent said they would vote "No" against 30 percent who would vote "Yes". However among those polled after, the "No" camp fell to 46 percent against 37 percent for "Yes". 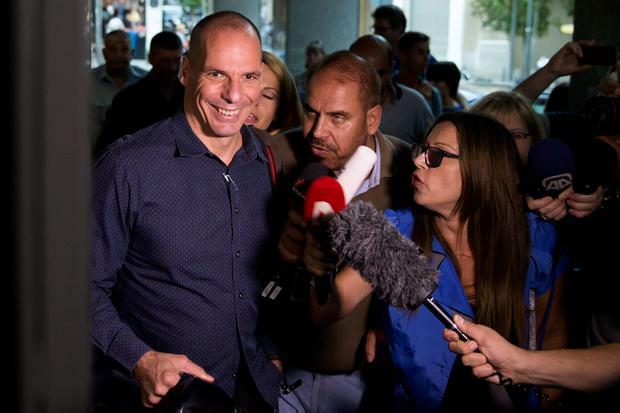 Seeking a "No" vote, Varoufakis told state television a deal would then swiftly follow, even as early as Monday, and the capital controls would go. "The ECB will press the button," he said.